Getting (and staying) organized at work is no easy feat. And your office messaging system is blowing up non-stop. It’s no wonder you struggle like craaazzzy to *actually* get anything done. Being organized at work is a necessity. AND have access to a couple of *very* helpful organizational templates. Let’s get organized, shall we? BUT it does take some effort. Because honestly, your life *outside* of work also has to be a bit organized for it not to cramp your style from 9 to 5. Fact #1 – Marketers who document their strategies are 538% more successful than those who don’t (which means it’s not left to chance). Fact #2 – Marketers who document their processes are 466% more successful than those who don’t (which means success is actually linked to getting organized). Fact #3 – Marketers who set goals are 429% more successful than those who don’t (and goal setting doesn’t just happen by accident – it takes an organized effort). ^^^Said another way, it’s proven that marketers who proactively organize are more successful than those who constantly fly by the seat of their pants. Getting organized is proven to help marketers like you succeed. (And tbh – that’s pretty sweet). Let’s dive into a series of organizational tips that are going to help you organize your life, your desk (cough cough), and your workload so that you can be a successful (and hella organized) marketer. Getting organized at work should actually start with making sure certain aspects of your life are well-organized, too. 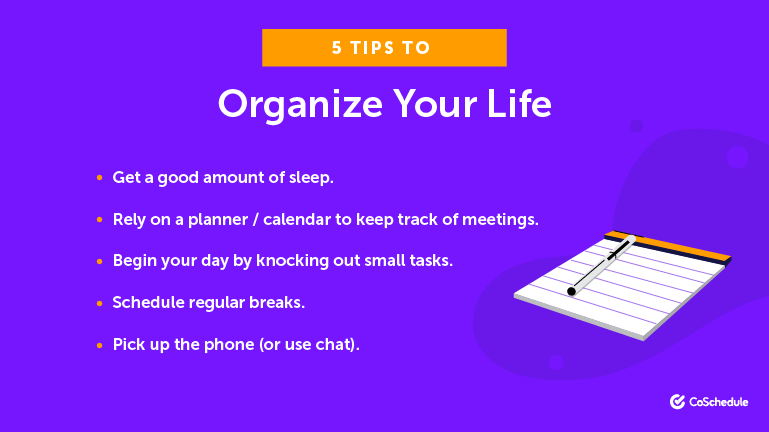 So before we jump into how to get organized at work, let’s jump into 5 ways you can organize your life. First things first – to really feel organized, you need to make sure to always get a good amount of sleep. It’s literally impossible to think clearly when you’re running on a shortage of snoozin’ hours and WAY too much caffeine. Rely on a planner (digital or paper) to help you remember (and show up on time for) every meeting. Begin your day by knocking out small tasks (check your email, put away laundry, unload the dishwasher, etc). But accomplishing small tasks right away in the morning also means you’re being productive right away. It’s a feeling of accomplishment that you can carry with you throughout the workday. Managing your mental state at work is KEY to getting organized. You need to give your brain a chance to relax – otherwise you’re going to feel mega-burned out by 3pm (and making decisions when your brain is tired is never awesome). For best results, try to give yourself a break in the morning AND one in the afternoon (about 15 minutes each). Take a walk around the office, around the block, change up your environment by hitting up a coffee shop – whatever works best for you and helps you feel refreshed when you get back. Pick up the phone – or use chat to communicate with others. Direct communication means you *actually* get answers. Sending emails back and forth is no good for anyone (and usually just results in a cluttered email inbox). Whether you’re checking in on your mom or getting information about an upcoming project at work – picking up the phone or sending a chat (Slack or Google Hangouts are great chat tools) makes sure your email inbox doesn’t get overloaded (at least as quickly as usual)…and you’ll usually get the answer you’re looking for MUCH faster. Who doesn’t love a nice and clean desk (and desktop), am I right?. Here are TWO tips to help you maintain a clean, organized workspace. General rule of thumb: clutter is a NO-NO. And finally, if you’re someone who likes to let random paperwork pile up on your desk – it’s time to implement a filing system. ^^Real-life before and after GIF of cleaning off your desk. Managing an email inbox that’s overflowing with project updates…random communications with your co-workers or clients…junk emails…spam…newsletter subscriptions….and meeting invites is NO cakewalk. AND create a filing system in your inbox so you know what’s top priority (and what’s not). Believe me when I say that email doesn’t have to = death. By simply getting organized and setting up filters (and folders) you CAN start managing your email inbox with ease. To recap: here’s a graphic with the two tips to remember so you can *always* have an organized desk. …how to have an organized workload. The real key to how to get organized at work lies in the proper management (and organization) of your workload. 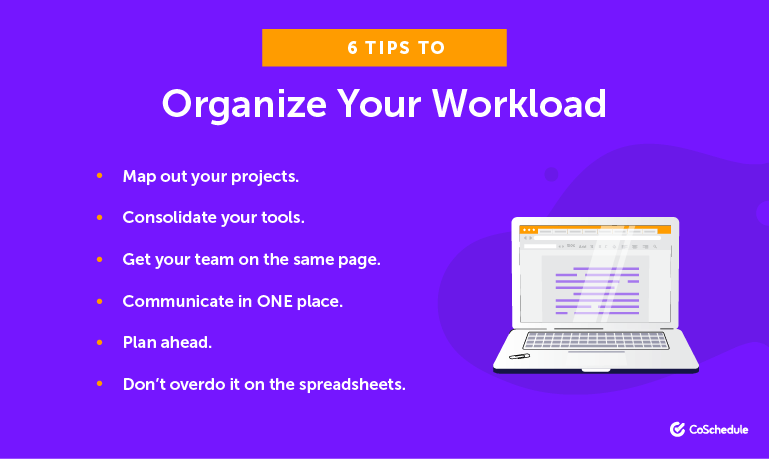 Let’s jump into six tips to an organized workload. Mapping out all your marketing projects on a roadmap makes it easy to understand what needs to get done today..
Plus (besides feeling insanely organized), getting everything mapped out makes it easy for you to prioritize your to-do list and easily stay on top of your tasks AND deadlines. 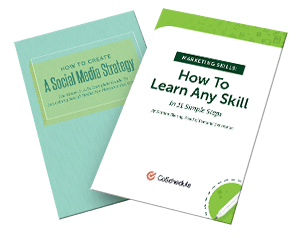 Managing a million different tools to execute your marketing strategy? Constantly jumping from screen to screen? Do you have a hundred tabs open on your computer at all times? If you answered yes to at least 2 of those questions…you probably have too many tools. AND decrease the amount of clutter on your computer screen. Make communicating with your team a priority. Whether you’re a fully remote team or all located in the same office – make sure everyone knows where to go to share + gather information. Keeping lines of communication open (and clear) makes it easy for everyone to stay in the loop. Make sure that information/communication with your team is shared in ONE place. If information is kept in multiple silos – no one is going to have a full picture of what is going on. Decide the best way for your team to communicate (keeping in mind that the information should be easily accessible for everyone) and stick to it. This tip relates to tip #1 – but is almost *more* important – because planning ahead spans beyond just mapping out your projects. Planning ahead means you take the time to fully understand the scope of a project, the resources you might need from other teams, the amount of time you will need to complete each step, if a team member is going to be gone, potential roadblocks – the list could go on and on. If you’re the leader of a team, this is your most IMPORTANT role – so make sure you give yourself plenty of time to thoroughly plan ahead on all aspects of your marketing strategy. Believe me when I say I KNOW spreadsheets are fun. But if you’re managing your spreadsheets with uh…spreadsheets…you’ve gone one step too far (and I know for a fact there is a better way to manage your workload). It’s time to look into how you could simplify your strategy (and search for a tool that could help). …a list of powerful organizational tools. Let’s get into how you can use powerful organizational tools to help you get even MORE organized. First up – a tool that makes it easy to keep track of your important events in one place, Google Calendar. 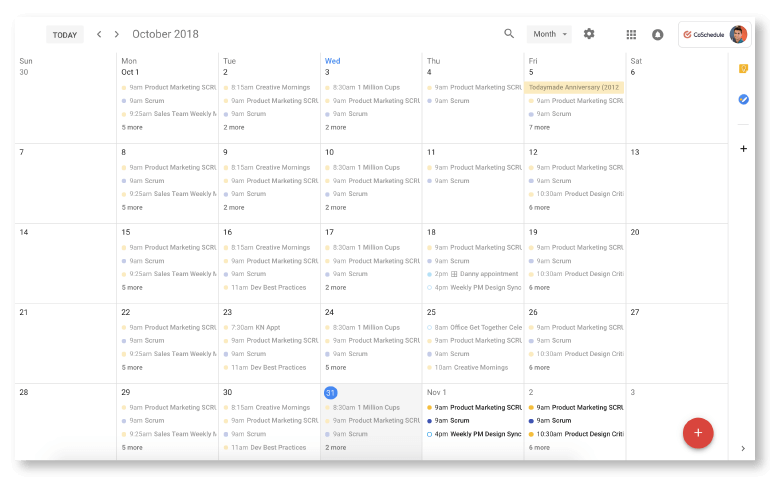 If you’re struggling to map out your projects and keep track of your meetings (both at and outside of work) – Google Calendar is a great free solution for you. Next – Google Drive. AKA one as of the best (and free) ways to organize, share, and collaborate on your content. 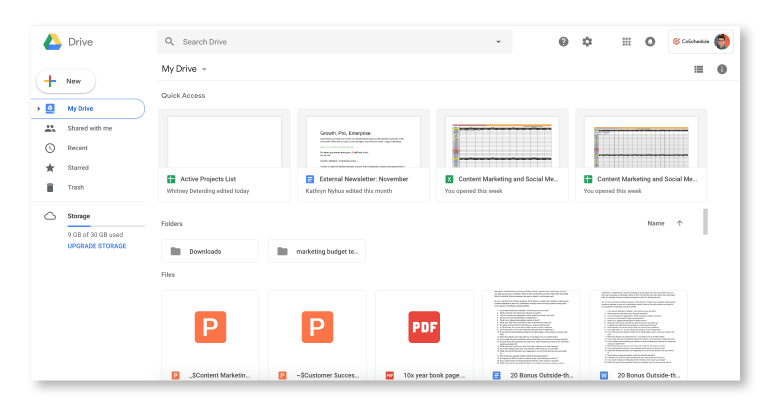 Google Drive makes it easy to sort your documents, spreadsheets, and presentations – while also making it easy collaborate with your team. 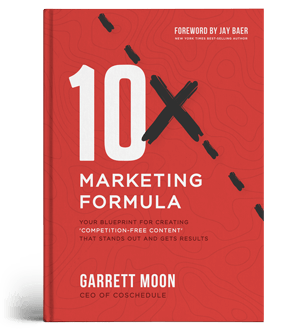 Have a thousand to-do lists for all your marketing projects? 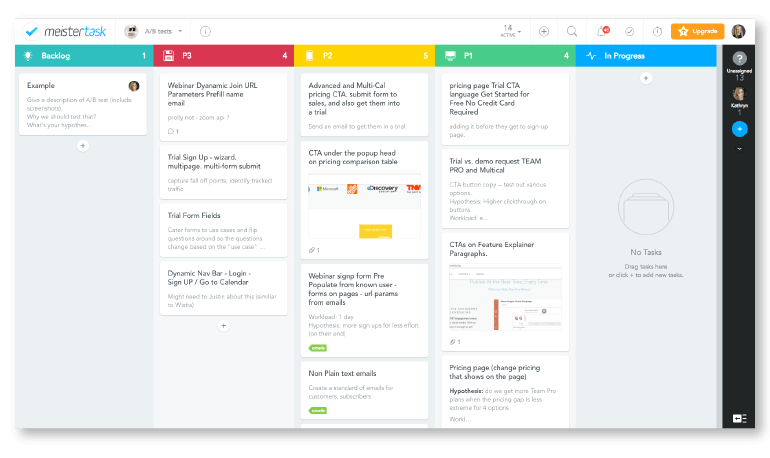 Meistertask makes it easy to manage tasks and collaborate with your team. Don’t have a great way to keep track of notes from your thousands of meetings? Look no further than Evernote. 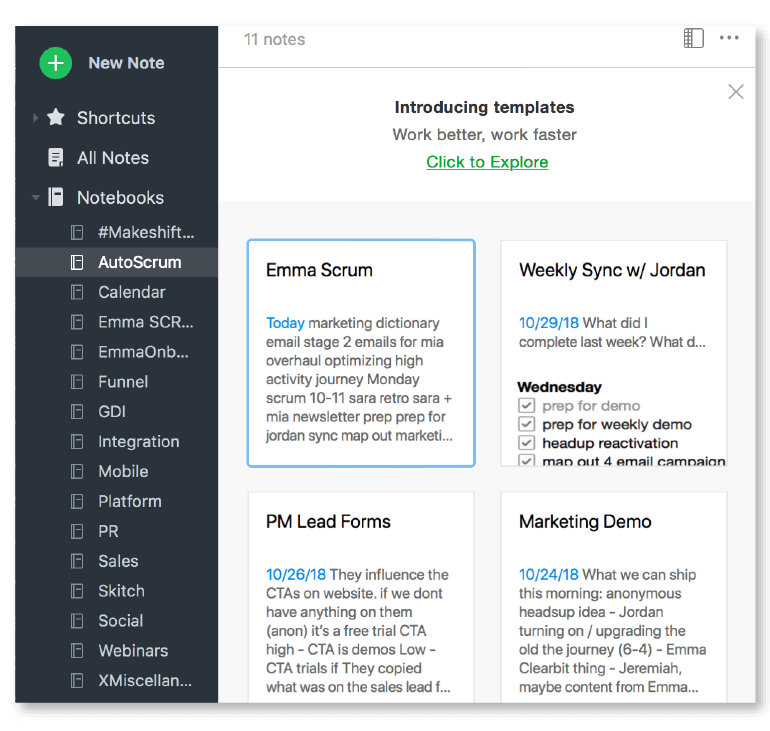 Evernote makes it easy to both take notes AND easily find them later. Have a ton of apps in your marketing toolkit? Zapier makes it easy to connect the apps you use every day to automate your work and be more productive. 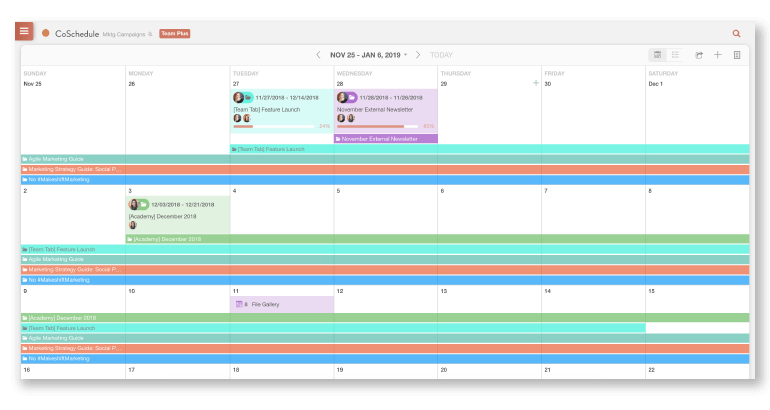 CoSchedule is mission control for your entire marketing roadmap. CoSchedule is a living, highly-customizable calendar that you can use to plan + manage every piece of your marketing strategy. Leave comments inside the discussions tab (especially if you have further instructions or want to leave notes as updates / changes occur). And add related documents to the project. Plus, if you need to move around projects (because let’s be honest, things happen), you can drag and drop projects to their new due date. ^It’s a very powerful organizational tool (with other functionalities like built-social publishing, analytics, and much more 😍). Let’s get you set up with some how to get organized at work templates. 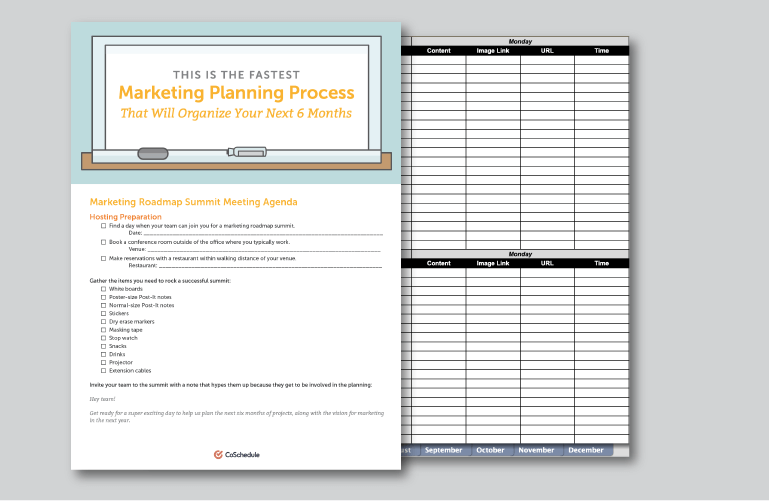 And use the marketing planning process template to help you organize the next SIX months of your marketing strategy. It’s time to take what you learned and *actually* get organized at work. And you will be well on your way to becoming a organized (and in turn, successful) marketer.